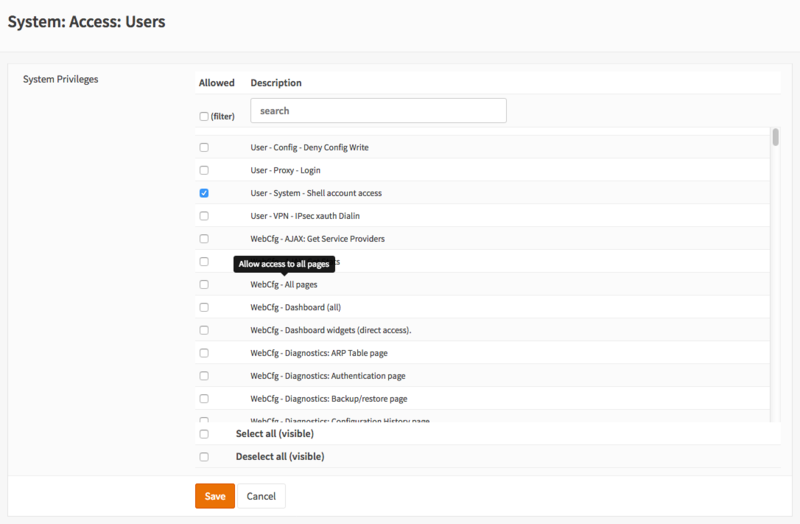 With the local user manager of OPNsense one can add users and groups and define the privileges for granting access to certain parts of the GUI (Web Configurator). To add a new user go to System ‣ Access ‣ Users and click on the + sign at the bottom right corner of the form. Login shell The shell to use when logging in via the console. Go to System ‣ Access ‣ Groups and click on the + sign in the lower right corner of the form. Enter a Group name and a Description and add users to the group. After creating a group the privileges can be added by editing the group. Go to System ‣ Access ‣ Groups and click on the edit symbol (pencil) right next to the group you like to change. To assign privileges, just click on the pencil icon on the right of Assigned Privileges. A form will be shown where each page can be either selected or deselected. The search bottom at the top of this form can be used to quickly find the right page. After making the right selection click on Save to store the new settings. User accounts can be used for logging in to the web frontend, as well as for logging in to the console (via VGA, serial or SSH). The latter will only work if the user’s shell is not set to /sbin/nologin and if group the user is part of is allowed SSH access. Enable secure shell Global on/off switch. Login Group Which user groups can access OPNsense via SSH. Permit root user login Normally, only non-root accounts are allowed for security reasons. This option enables root login. Permit password login The recommended login method is using SSH keys as it’s more secure, but this option will also enable password logins. SSH Port Defaults to 22, but can be changed to make port scanning less effective. Listen interfaces By default, SSH listens on all interfaces. You can limit this (to just the LAN, for example) for additional security at the cost of availability.